Founded a decade ago, LendKey’s objective is to revolutionize the lending industry by providing an online lending platform for the thousands of community banks and financial institutions located across the United States. 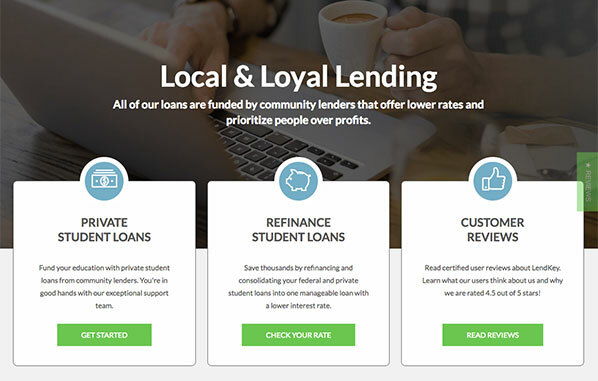 The company offers customers a lending marketplace for student loan refinancing that enables them to create beneficial customized terms for repayment. LendKey has demonstrated a longstanding commitment to work with smaller regional credit unions and banks to provide more transparency and lower interest rates for customers. In addition to partnering with community banks to broaden their reach, LendKey is constantly striving to improve their technological solutions to provide the best possible service. Today, LendKey’s network includes over 275 community non-profit lenders, helping customers access over $1 billion in financing for more than 60,000 loans. Although the company is not directly a lender, LendKey can still help a broad range of customers uncover the student loan refinancing and consolidation options they need. LendKey’s marketplace grants customers the opportunity to find refinancing loans for a range of outstanding student loan types. The company prefers to work with customers that have good credit, making them an ideal partner for students who have developed strong credit or have cosigners available to assist with the process. Moreover, the company’s refinancing offerings are excellent for customers who have taken out both private and federal student loans, and are looking to consolidate them into a single, lower-rate payment. Customers with positive financial habits can also benefit considering LendKey’s incentives for those individuals who are responsible when it comes to consistent repayment. We found several aspects of LendKey’s service to be quite useful for students and graduates alike. The company does not directly provide the loan, however it does originate loans and also offer customers an impressive degree of freedom when seeking out repayment terms and loan amounts. Customers have the ability to customize their loans and find those lenders that are most likely to meet their requirements, from repayment amounts and terms to amounts and even preferred rates. Apart from these benefits, LendKey partners offer great incentives for customers to lower their interest rates signficantly. Borrowers are eligible to receive a 0.25% reduction to their APR when they sign up for AutoPay. In addition, we were happy to see that LendKey allows borrowers to consolidate their loans, both private and federal, into a single lower-rate repayment. The company also hosts several informative educational resources including a downloadable guide to student loans that can help borrowers save sigificant time and money when applying for financing. Different lenders may have additional requirements, so customers should always have their documents prepared in advance and confirm with their chosen loan provider that they meet all the relevant criteria. Once they have received approval, borrowers can customize their loan, finding their preferred repayment terms and amounts, as well as interest rates. Customers seeking student loan refinancing options on LendKey’s marketplace will be awestruck by the variety of choices they encounter when searching for the right loan and provider to work with. While LendKey is not directly a loan originator, borrowers complete their prequalification application and finalize their selection for loans through their website. Apart from the depth of borrowing options, the company helps customers by waiving many of the charges competitors may include during the refinancing process. LendKey and its partners do not charge borrowers any application, origination, or prepayment fees. Moreover, the company’s network of lenders is not made up of major banks and financial services providers, but rather smaller community banks and credit unions. In real terms, this gives customers access to more favorable rates and better transparency throughout the process of applying and receiving approval for student loan refinancing. Graduates looking for a refinancing loan can be approved for variable APRs ranging between 2.58% and7.26%, or fixed APRs between 3.25% to 7.26%. Refinancing also qualifies for automatic payment discounts. Customers can get even steeper discounts on their interest rates by exhibiting responsible financial behavior. The best part is that LendKey accepts customers looking to refinance undergraduate and graduate loans, originated either privately or through federal programs. The company’s partners also offer unemployment protection for a period of 18 months, a high industry water mark, as well as interest-only repayment for up to the first four years of borrowers’ terms. Overall, LendKey offers a good variety of loan term options. Refinancing applicants have several choices available, with repayment terms of 5, 7, 10, 15, and 20 years for variable rate loans and 5, 7, 10, and 15 years for fixed rate refinancing options. It's worth noting again that LendKey's highlighted repayment term is the 4 year interest only option on a 15 year loan term, which no other company currently offers. All told, these terms are industry-standard, enabling potential refinancing customers to find the most beneficial term for their needs alongside the most favorable interest rates and repayment amounts. One of the aspects of LendKey’s services that we appreciated most was the company’s commitment to helping customers from the start to the end of their application and funding process. While the company is not directly a lender, they are different from other refinancing marketplaces thanks to their constant involvement. Customers can rest assured knowing that LendKey will not sell their information to less-than-reputable lenders. Furthermore, the company works with community institutions that are transparent and collaborate with LendKey throughout the refinancing process. The company does collect customer data, but information is stored in secure data centers that feature robust encryption and industry-standard safety measures. Customers who need to contact LendKey have several channels available to them. Borrowers can contact the company via a toll-free number Monday through Friday between 9:00 AM and 8:00 PM Eastern Standard Time. Additionally, customers can email a company representative with responses usually taking one business day to arrive. Overall, we found the company’s support team to be well-versed in student loan refinancing, and able to answer all our questions effectively. For customers who prefer to find answers on their own, LendKey features an informative FAQ section and hosts numerous educational resources that deal with the basics of student loans and refinancing. Overall, LendKey offers an intriguing alternative for student loans. Customers can tailor their loan terms for maximum savings and benefits while the ability to refinance and consolidate both private and federal loans is a notable advantage. We were impressed with LendKey’s commitment to working with local and community financial services providers such as credit unions and regional banks. This empowers customers to find lower interest rates and a more transparent financing marketplace than institutional lenders can provide. We were happy to see that LendKey also emphasizes education and offers excellent resources to customers to better understand the intricacies of student loans and their options when refinancing. This choice reflects an excellent service for graduates with good credit who are looking to take advantage of potential interest rate discounts.